For years, various aviation associations and collegiate programs around the U.S. have offered vital scholarships but the numbers impacted are small, so ORBAA decided to try a different approach. In early spring of 2018 ORBAA approached the PAST Foundation at the recommendation of the Columbus Greater Arts Council (GCAC) as a kickstarter for thinking differently about engaging young girls. PAST Foundation, an independent educational R&D group eagerly joined the conversation. Over the next few months, a plan developed that would draw on the expertise of ORBAA’s members and PAST’s experience with developing immersive STEM educational models. Together, ORBAA and PAST laid out a multi-tiered plan that scaffolds from a one day design challenge, to a weeklong summer out of school program, to the eventual development of a thematic STEM Middle School program model; all focused on strengthening the workforce pipeline for aviation. The first step was to plan and fund a Design Challenge. • Underwrite the Design Challenge Day for 120 girls. The team quickly found a strong partner in AEP and Columbus State Community College Credit Counts, who together with their partner I Know I Can, a college readiness program, sponsored, recruited and bussed 135 girls to the Design Challenge. Many other corporations and post secondary programs stepped forward to support the event. A full listing appears on the poster for the event and here at the end of this report. Regular meetings and outreach to regional and national experts produced and refined four design challenge activities, coalesced multiple partnerships, and ultimately created a two day set of events that far exceeded the original goals of the team. The following report outlines the events, the partners, sponsors, student participation, and learning impacts of the design challenge. Finally the report sets forth a series of recommendations that lay out next steps as ORBAA and PAST continue to design and create the next phases of the overall vision. 3. 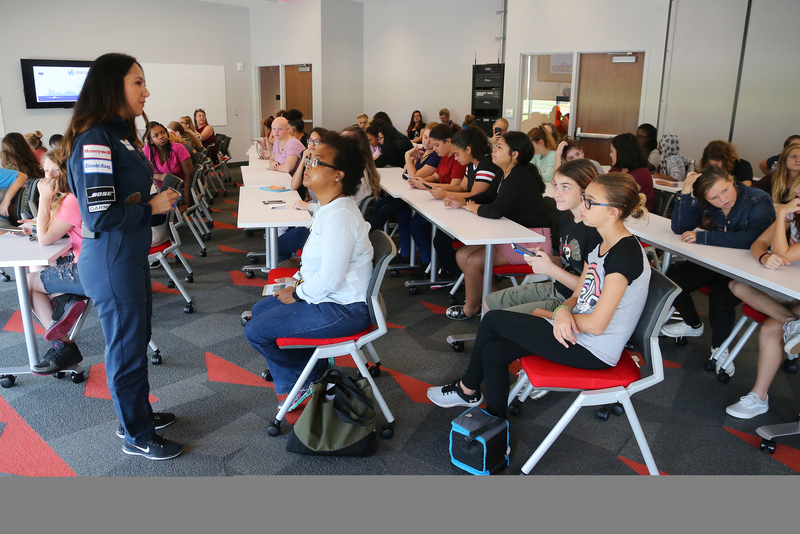 Girls Soar Design Challenge with 120 Columbus City School Middle School girls. The first event scheduled for the afternoon of September 19th took place at the PAST Innovation Lab. Shaesta was introduced to 375 middle school students from Metro Early College Middle School. The students had the opportunity to see the documentary chronicling Shaesta’s round the world trip and hear her Shaesta speak about her adventures. She fielded numerous questions about her experiences growing up, as well as her circumnavigation. After the event with the middle school students Shaesta met with the aviation club students and the high school robotics team. The evening was topped off with a reception for sponsors and their families. Dr. Annalies Corbin of the PAST Foundation and Lauren Behrens of ORBAA welcomed everyone, speaking of the impressive effort of all the sponsors to bring the opportunity to Columbus. The day of the Design Challenge was hosted by Ohio State University’s Don Scott Airport at the newly opened Knowlton Terminal. One hundred and thirty five middle school girls from Columbus City Schools’ Woodward Park, Westmoor, Dominion, and Columbus Prep for Girls attended the event. Volunteers from ORBAA, Ohio State University’s Aviation Program, Foxtrot, and PAST Foundation helped facilitate the activities. Dr. Robert Priestley and students from Kent State University demonstrated air traffic control, while Ohio University brought in a D3 for the static tour. OSU, CDP, and Bonanza all lent aircraft and personnel for the static tour. 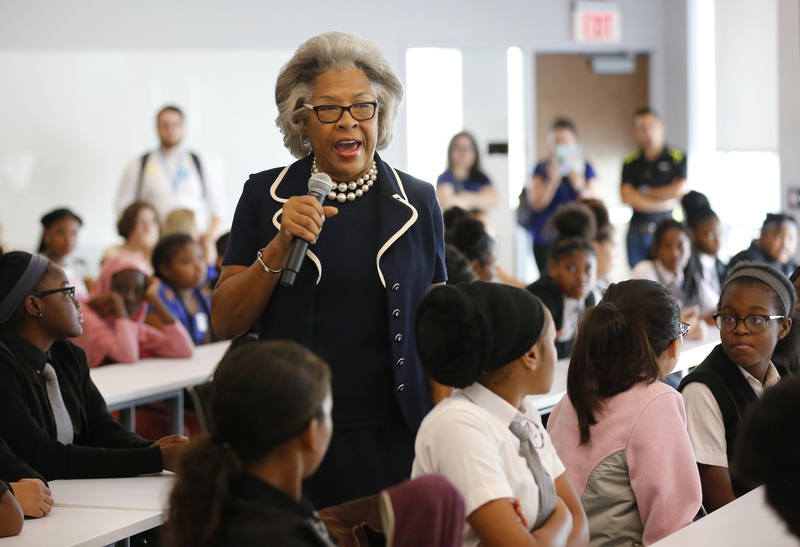 Leading off the daylong event was Representative Joyce Beatty who welcomed Shaesta to Columbus and revved up the girls with her enthusiasm for STEM career potential in all girls. 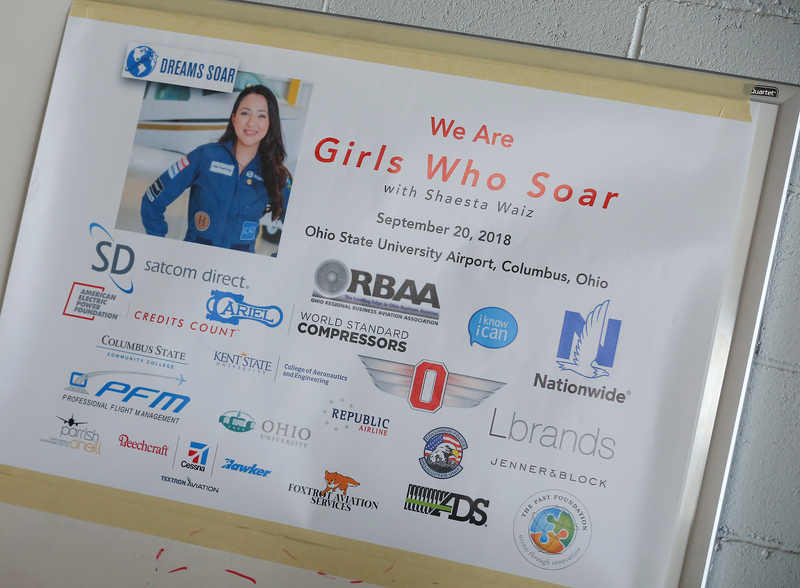 Shaesta followed Representative Beatty and once again shared with the students her experiences both in her quest to become a pilot and her audacious trip around the world promoting STEM. At the conclusion of her talk the students assembled in Hangar One for the design challenge activities. On the bus to the Design Challenge all of the girls were asked 4 questions. What is the job of an Air Traffic Controller? What are two ways to measure speed? What must be true in order for lift to occur? How does the shape of a wing help a plane fly? The answers were collected and later analyzed to ascertain the amount of “fund” knowledge the students possessed prior to the activities and day’s events. Once in the hangar the schools divided up among four activities all reflective of important concepts in the various career pathways of aviation — Glider, Air Traffic Control, Propellor, and Lift. Each activity began with a challenge and concluded with a demonstration of learning. Full design challenge activity plans are attached to this report. The activities ran for 30 minutes and then the teams rotated to the next activity. After finishing all the activities the girls were treated to lunch and then a tour of the visiting airplanes parked just outside the hangar. 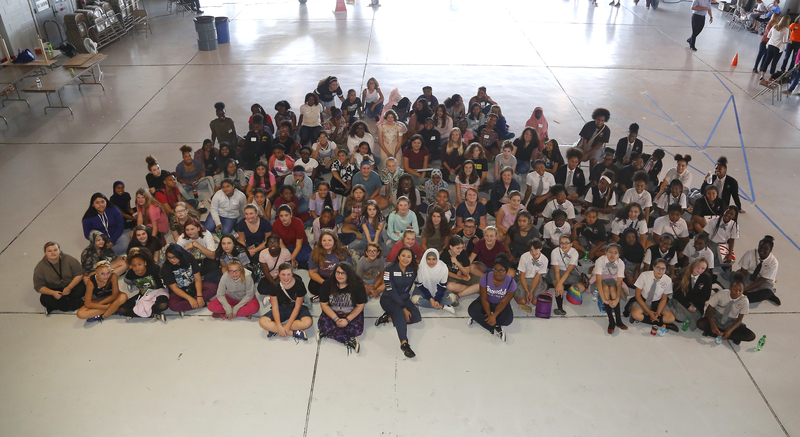 At the conclusion of the days events each student received a swag bag chocked full of items donated by the the event’s sponsors and intended to continue to spark interest in aviation. On the bus ride back to school the students were asked the same 4 questions as they were asked on the way to the event. The purpose was to measure the knowledge gained through the activities. The pre and post quiz responses were then analyzed for short cycle growth in gained knowledge. The comparative data is presented below in the snapshots of the four design challenge activities.